First, we look at West Virginia. I see two key stats: PPP says the state’s Likely Voters went for McCain 54-38 (MoE 2.8) and show a registration advantage for Democrats 55-35. The natural place to look for a baseline for these numbers was the wave for the Democrats in 2008, in the exit polling from that year. If PPP’s numbers look like those, or better, then PPP is projecting a wave for the Democrats this year, most likely. And so for the West Virginia Senate race in 2008, we see that the partisan breakdown per CNN was 49 D-33 R (MoE 3, if you believe Exit Polls are as random as we need them to be). So while the exit poll last time showed a D+16 registration advantage, PPP this time shows a D+20 registration advantage, seeming to project and even larger wave for the Democrats. Further if we check the Presidential returns for West Virginia, we see that the state went for McCain 56-43 (no MoE, as this is the actual result), or R+13. PPP shows the state going for McCain 54-38, R+16. 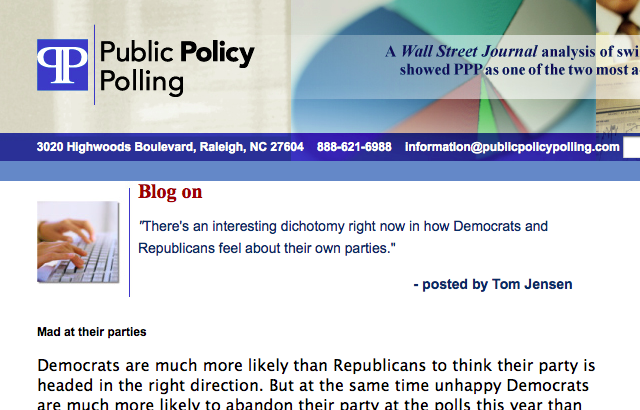 So even more oddly, PPP seems to be suggesting a wave of Democrats who dislike Barack Obama. Schwa? Moving onto California, PPP shows Barack Obama winning 57-37, and Democrats with a 47 D-34 R-19 Other registration advantage. The actual CA result was 61-37 Obama, and the CA exit poll showed a 42-30-28 registration advantage. So PPP seems to be showing fewer independents, more Democrats, and fewer Republicans in California than 2008. And unlike WV, CA doesn’t even show any additional support for John McCain than the actual 2008 election. No anti-Obama, anti-Democrat, or even anti-incumbent wave at all, really. If you think that’s likely, then PPP’s likely voter screen should be accurate. If you don’t, then PPP’s results need to be adjusted mentally before being digested. And that’s not fraud, by the way, as some will say. That’s just an inability of PPP’s model to handle back to back wave years in opposite directions, which is a pretty minor failing of a model I believe. I attempted to adjust the poll results so that the distribution reflected the exit polling numbers instead of the assumption in the PPP model. Both lose a bit from their base and the impact of the independents results in a shift of about 4.5% in Carly’s favor. In effect making this a dead heat. My numbers are rough, but even if close this completely alters the spin from this poll. I’m sure that there are many pitfalls in applying these numbers in this way. I would be very interested in your view about trying to do this.